Another Art Nouveau-styled wallpaper, because I can't get enough of that vintage look and feel. 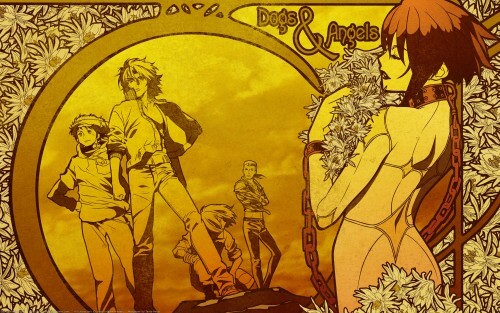 And from Wolf's Rain, which has plenty of great scans to fit that style to a T.
A very long time ago I started a wall called "Dogs & Angels" which was going to use this scan of Cheza and the wolves. I had traced Cheza, and then abandoned the wall. Fast forward to a few weeks ago, when I saw this scan of the wolves and wanted more bishounen on my desktop. So I traced the wolves, and was trying to figure out how to put a nice Nouveau frame around it when I remembered the old Cheza scan. I had to retrace Cheza because I'd purged the old one ages ago in a fit of cleaning, but I began to put the two images together. The frame idea actually came from Atelier Marie, another series with tons of great Nouveau-styled artwork, because I wanted a round frame that was reminiscent of a crescent moon. Add in a bunch of flowers from an old Wolf's Rain wallpaper and you have this. I kept the old name, because it was still appropriate. Textured, for that vintage poster feel. A beautiful and seemless combination of various different elements. Without reading the description (or a knowledge of the series) you would never know that this is not that this wasn't originally one image. The vectoring is strong with a strong Mucha influence with the extremely detailed yet bold line work. The use of textures with a rainbow of sepia creates the look of an antiqued lithograph. Beautiful work that would look at home on a museum wall as well as your desktop. Proposed by Chloe and highlighted by Saikusa. Wow, great job! I really like flowers. Amazing details. Add to favourite! Just kidding, you just wrote where you got the idea from, but... anyways... never seen Wolf's Rain before, but liked your wallpaper a lot. and the font is like bleh; there are tons of hot AN fonts no? This is awesome. I love nouveau. This must have been a crapload of work. Great job! Man, I would never have the patience for this type of thing! Love the colors and the vectoring is just insanely neat. Great job! I love the details. fav. omg! wonderful artwork just wonderful~ the details and everything~ nicely done! keep it up! Great Work. I like the yellow the way you used it. It's a bit nostalgic since i saw wolf's rain a long time ago. Awesome wallpaper. It looks so cool! That yellow is fantastic! Great work! XD Thank you for posting it! Great wall! Thanks for sharing that!